… but we happened to be walking past our local second-hand book shop. We hadn’t expected it to be open on a Bank Holiday, but it was. The door was open even though the weather was cold, and so we went it. It would have been rude not to go in! And there was new stock! 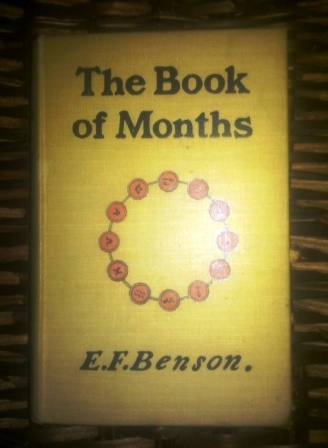 A title by E F Benson that I had never seen before in a lovely edition nearly 100 years old: The Book of Months. I looked closely at the Penguin shelves. I’ve always loved Penguins, but my interest has been heightened since I met Karyn at A Penguin a Week and perused her lists of the three thousand books published in numbered editions. There were so many book that I loved on those lists. 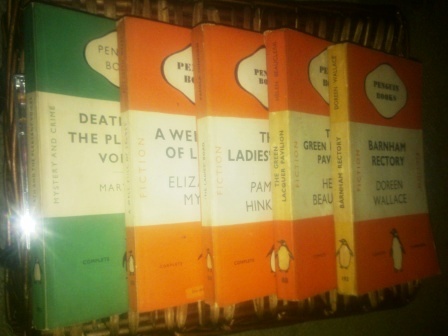 I noticed many books from my Virago collection. And sprinkling of Persephone authors. And Angela Thirkell! I suspected that there might be gems among the titles and authors that I didn’t know too. And so I pulled out a quite a few books, and I think I may have found some gems among them. That set me to wondering where the reader in me was born. Here in Cornwall I think, some years before Myself. Where was the reader in you born? Another lovely title, and the author’s name rang a distant bell. The opening paragraphs, beautifully describing a visit to the park sold another book. I could never resist a book with a vicarage or a rectory in the title, and so this one came home too. … it’s wonderful what you can find when you’re not really looking! I love the sound of these books, Jane, and also the fact that they are randomly chosen. I should do that more. I’m always so busy looking for certain names that I ignore other books that could be equally good, if only I was prepared to take a risk on an author unknown to me! I look forward to hearing about them! Oh my. I’m speechless, and that doesn’t happen often! What a haul. I can’t wait to hear about them as they are read! So jealous! I live in the used book wasteland of Arizona and can never find anything half as interesting as you all can find in the UK. I look forward to your thoughts on these. I love stories with vicars as well. That is why I loved Susan Howatch. I am now reading Barbara Erskine’s Time’s legacy (also with lots of vicars) and it is absolutely amazing. I know of no better way to spend a day. We just spent two weeks in the south of England visiting bookshops in small villages, looking for Penguins, but we didn’t make it as far as Cornwall. And in the end the snow defeated us. You capture exactly the most wonderful aspect of a collection of old books, this sense that they are a treasure trove into which you can delve and find something unexpected. I look forward to your reviews, and after seeing that table of contents, I think I’ll have to make The Green Lacquer Pavilion next week’s book. That Penguin a Week blog is crazy! I love it. I stayed at a B&B in Gloucester in 1989 and there were three shelves of nothing but these old Penguins. At the time I didn’t recognize any of the authors. I have a feeling it would be a different story today if I could be transported back to that B&B.